According to a recent article published by Recode, the business of mass media is no longer straightforward. Content companies — studios — made stuff — TV shows and movies — and sold it to pay TV distributors, who sold it to consumers. As tech has enabled the development of new media such as streaming, established media companies have shifted to become content creators as well as distributors. The article points to examples like Netflix (2.1 – Lean Liberal) to illustrate this new type of hybrid media corporation. The chart below explains the outlines the major player of the media landscape and the roles they currently fill. 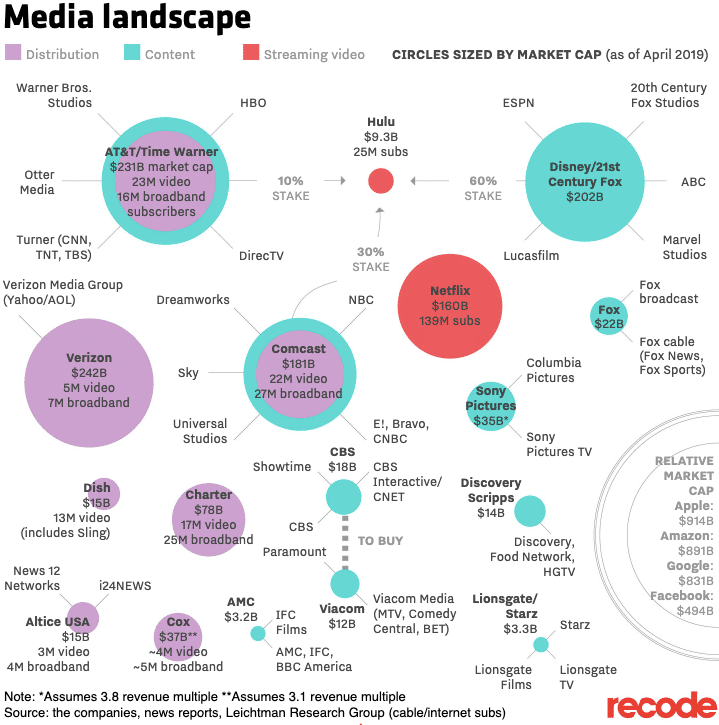 Interestingly, as noted in the graphic, tech companies Apple (1 -Liberal), Amazon (1.3 – Liberal), Google (1 – Liberal), and Facebook (1 – Liberal) dwarf the traditional content and distribution companies in terms of relative market cap. Click the links below to see where all of these companies stand on the issues. Doesn’t it seem that conservatives should start looking at DISH Network for their entertainment dollars?